There is deep, and then there is deep. Though the brainwave patterns on the Primary Meditation Tracks go as low as 0.3 Hz—which is truly deep enough for advanced spiritual growth—some of us really would like to go as deep as possible in meditation. For those of you who share this aspiration, the Epsilon Program takes you there. The frequencies on these tracks range from 0.1 Hz to 0.001 Hz. Why would you want to take your meditation practice to the very limits? Maybe just because you can. 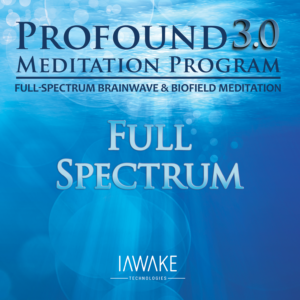 But also, there is evidence to suggest that these ultra-low frequency brainwave patterns can act as carriers for some of the ultra-fast frequencies found in highly advanced meditators and associated with extraordinary experiences and insights. The Epsilon tracks are thus one of the most experimental and cutting-edge aspects of the overall Profound Meditation Program. The feedback so far from early adopters has been phenomenal, and we invite you to join us in the adventure. Use these tracks to supplement, extend, deepen, and add even greater dynamic variability to your Primary Meditation. Use of headphones is required to experience this demo properly. To fully experience the potential of this program, please get comfortable, close your eyes and relax for the next 5 minutes. Allow the ocean waves to immerse you in a deep sense of relaxation and peace. Don't be fooled - this is not just beautiful ocean waves - it is the design and technology infused in the soundtrack that evokes the deep relaxation response. Epsilon is the most profound of audio entrainment techniques I have used . I have been using these techniques for many years and I salute you and your team for such enlightening work. I LOVE the Epsilon tracks. Each time I have listened to PM 2-1 beforehand. They might be my favorite audios so far. I drop into stillness and feel wide and unlimited when I listen to them. The Epsilon sessions do not feature a ramping descent that begins at the Beta pattern (which will most often be the predominant pattern before starting a meditation session) and slowly descends to the Delta pattern. Optimal entrainment, therefore, will occur if you first listen to Track 1 (Descent from Beta to 1 Hz Delta in the first 16.5 min, followed by 3.5 min of 1 Hz entrainment) of the Primary Meditation Tracks before listening to Track 1 of Epsilon. Listening to Epsilon Track 1 (or any of the Epsilon tracks, for that matter) without first listening to Primary Meditation Track 1 will still result in entrainment. The resulting degree of entrainment, however, will usually not be as great as it is when first listening to Primary Meditation Track 1. To experience the greatest degree of entrainment with Track 2 of Epsilon, it is advised to first listen to Track 1 of Epsilon. Likewise with Epsilon Track 3, optimal entrainment will occur when it is preceded by Epsilon Track 2. Because Epsilon Tracks 2 and 3 are uncommonly deep, it may take a few minutes after having begun before you notice your brain “locking in” to the entrainment signals. The more often you use the Epsilon tracks, the more deeply you will entrain to their signals as repeated use trains the brain to respond more sensitively to the entrainment stimulus. The Epsilon tracks add yet another element of variety to the PMP 3.0 system, allowing for the greatest degree of variability and precision stimulation. Consciousness researcher Dr. Jeffrey Thompson altered conventional EEG equipment to study the extraordinary states of consciousness of seasoned meditators and yogis. He later decided to call one of these uncommon states of consciousness he discovered Epsilon, a brainwave pattern even slower than Delta. Dr. Thompson measured the range of this pattern to be from below 0.5 Hz (or cycles per second) to as low as one quarter cycle every ten seconds. He also discovered properties of this pattern that led him to believe it to be a carrier wave for the ultra-fast brainwave patterns he observed in other expert meditators, patterns as fast as 200 Hz or more. Epsilon tracks which I use only at night when I know I am going to bed right after, they have a soporific effect on me. And I deeply enjoy it. If you are not completely impressed with Epsilon Meditation, let us know within the first 90 days, and we’ll gladly give you a full refund.